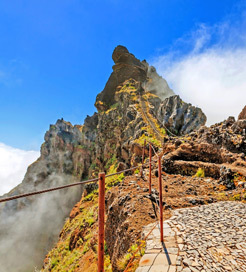 Pico lies in the heart of the Azores Islands in the North Atlantic and is nicknamed the ‘Mountain Island’ due to its imposing volcano, the highest in Portugal. As you would expect, then, Pico provides the perfect setting for challenging hikes and scenic walks. Reaching the mountain’s summit offers sublime panoramic views, whilst the Achada Plateau to the east has a fascinating 30 km-long ridge and 200 volcanic cones with bogs, ponds and lakes. Also, be sure to explore the Gruta das Torres in the west, the longest lava tube in Europe with an estimated length of over 3 miles. Although lacking beaches, the coastline is dotted with the most beautiful natural swimming pools in the archipelago which are ideal for relaxing in after a long hike. The finest pools can be found in Sao Prainha, Sao Roque, Santo Antonio and Madelena, so there’s plenty to choose from. As well as exploring the landscape, keep a keen eye on the surrounding waters, as Pico has long been a great destination for whale and dolphin watching. Those looking for some more white-knuckled fun will be glad to hear the Azores are regarded as one of the best places in the world to dive with sharks, namely blue and shortfin mako. For a more tranquil afternoon, organise a tour of the UNESCO World Heritage Site listed vineyard and the fascinating wineries to learn about how the volcanic soil helps create internationally acclaimed whites and reds. Like every island in the Azores, Pico has a rich festival culture, most notably the celebration of the patron saint, Maria Madalena which includes various sporting and cultural activities during July. If visiting in September, don’t miss the Festas da Vindima, a grape-picking festival involving a series of interesting dances about wine production. You can sail to the port of Sao Roque on Pico’s north central coast from the Azores Islands of Faial, Flores, Sao Miguel, Terceira, Sao Jorge, Graciosa and Santa Maria, with a few crossings provided each week. For more information, please visit our Ferries from Faial to Pico page. For more information, please visit our Ferries from Flores to Pico page. For more information, please visit our Ferries from Sao Miguel to Pico page. For more information, please visit our Ferries from Terceira to Pico page. For more information, please visit our Ferries from Sao Jorge to Pico page. For more information, please visit our Ferries from Graciosa to Pico page.